Yusho's first ramen battle went down this past Sunday, Feb 9, between Publican Quality Meat's (PQM's) Cosmo "Publican Enemy" Goss and Blackbird's David "Smackbird" Posey. This was an event I couldn't miss, as I am an avid supporter of One Off Hospitality establishments, including PQM and Blackbird. Being present at the first ramen off, and being able to vote for two chefs who I admire (and have become friendly with) was important to me. Furthermore, I have a deep passion for Japanese food due to my time spent travelling in Japan. This was shaping up to be a great event since Chef Matthias's (Yusho) ramen is some of the best in the city. Here's the down-low: $25 got you the ramen of your choice, a cocktail or house made soda, and Yusho's famous soft serve. Guests were able to vote, on a 1-5 scale, on which chef's ramen was the best. The voting ballots were very creative; I loved the cartoon charaters for the two rivaling chefs. I went with my girlfriend, April Francis, (founder of Dose Market) to the event. We had tons of fun but it was really difficult choosing the winner as both ramen's were very delicious and belly warming on a cold Chicago evening. Comso's ramen featured pho belly, thai sausuage, maguro shuto, farm egg, and flavor crystals, while Posey's made his ramen with tonkotsu, miso pork, potato, cabbage, soy egg, and burnt leek. 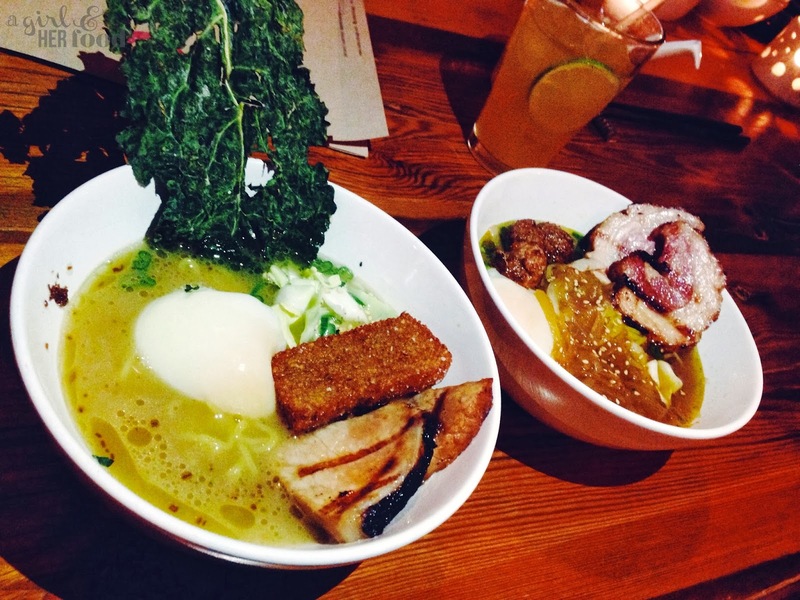 In the end, Cosmo's ramen came out on top. Congrats Cosmo and PQM! Yusho's plans to host monthly ramen battles between local chefs... Next month is Jason Hammel of Lula Cafe and Abraham Conlon of Fat Rice. I hope I get my seat for that one! To get Yusho's event news, subscribe to the newsletter on their site.